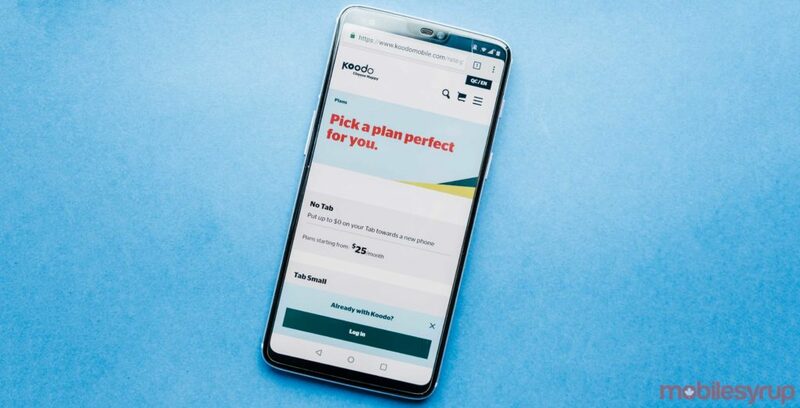 Koodo has quietly increased the prices of its ‘Tab Medium’ and ‘Tab Small plans,’ with potential subscribers now looking at $55 CAD and $45 priced plans, respectively. Those currently on either of these Koodo plans will not experience a bill increase. In March 2019, Koodo raised the cost of its Medium plan from $45 to $5o per month. Not only did Telus’ flanker brand increase the price of its plan from $50 to $55 within a month of its previous price jump, the Tab Medium plan now only includes 2GB of data instead of the original 4GB of data. That said, Koodo did add unlimited to Canada-wide minutes, which is a bump up from the previous 500 Canada-wide minutes. Koodo’s Tab Small plan increased from $35 per month to $45 per month. This plan includes unlimited minutes and messaging and pay-per-use data starting at $10 for 100MB. The company’s Tab tiers determine how much money a client will spend when purchasing a new handset. Tab Medium plans will take $360 off the upfront cost of a new device, while the Tab Small slashes $240 off the cost of a phone. Back in January, Koodo increased the cost of its Tab Large, Tab Extra Large and Tab Extra Extra Large by $6 each. We’ve reached out to Koodo for comment regarding this price jump.